The Toledo Rockets spent their first day in Mobile, Ala., enjoying some Southern hospitality at a shrimp boil dinner at Ladd-Peebles Stadium Tuesday evening. Ladd-Peebles will be the site of the 2017 Dollar General Bowl that will pit Toledo vs. Appalachian State Saturday, Dec. 23, at 7 p.m. Eastern time. The game will be televised by ESPN. 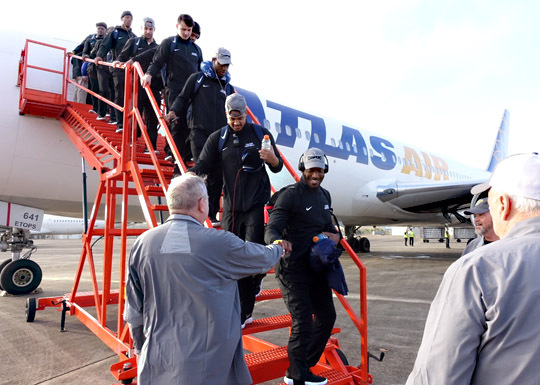 The Rockets were welcomed when they landed in Mobile, Ala., where they’ll play in the Dollar General Bowl Saturday, Dec. 23. 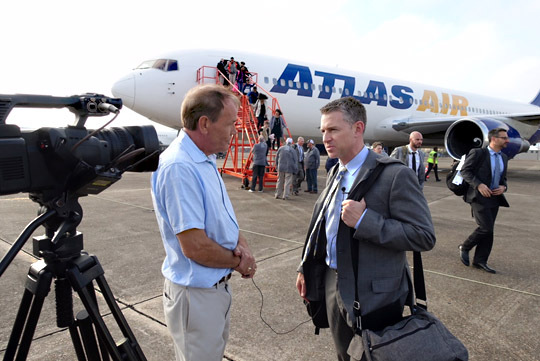 The Rockets landed in Mobile about 3:30 Central time before heading to the stadium for dinner. Prior to dinner, Head Coach Jason Candle met briefly with local media; he lauded the great tradition of football in the state of Alabama. Wednesday’s agenda includes a morning visit to the University of South Alabama Children’s and Women’s Hospital; the team’s first practice in Mobile; and an evening bowling competition vs. Appalachian State. Head Football Coach Jason Candle spoke to local media after he got off the plane. This entry was posted on Wednesday, December 20th, 2017 at 3:50 am and is filed under Athletics, Events, News .